The Orbit White Glass and Chrome Coffee Table will bring an instant freshness to your living room interior. 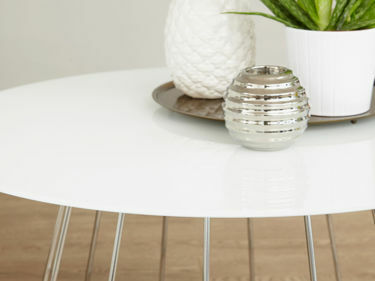 The white painted back tempered glass top gives this table a wonderfully crisp look, while the intricate chrome base really makes the Orbit coffee table stand out from the crowd! 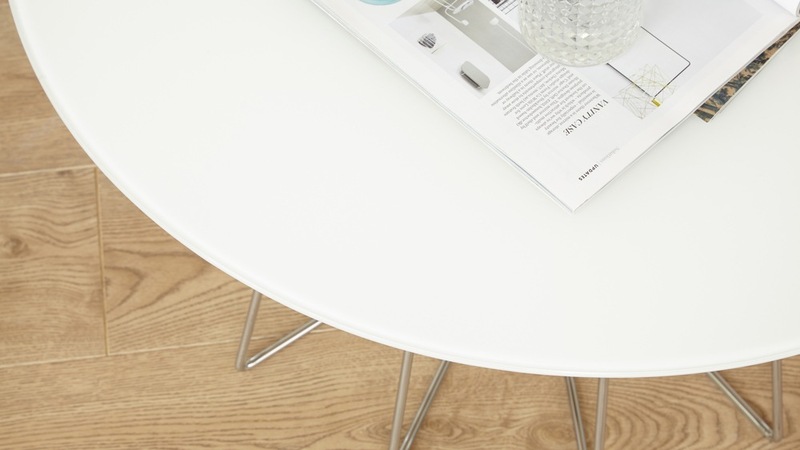 The Orbit White Glass and Chrome Coffee Table measures 40cm in height and 80cm in diameter. This considered sizing makes the coffee table a great fit by a corner sofa or in the centre of your seating space. To create the crisp white finish, we've used a clear tempered glass with a painted white back. The great thing about this is that you get a reflective surface, like with white gloss, but it is very strong because it's made from tempered glass. The tempered glass used for our Orbit coffee table is tested to British Standards, ensuring that it is incredibly resistant and durable. The base of the Orbit is a circular, bent open frame. It's a really interesting design feature rather than having legs or a pedestal base, making the Orbit a really impressive looking piece. 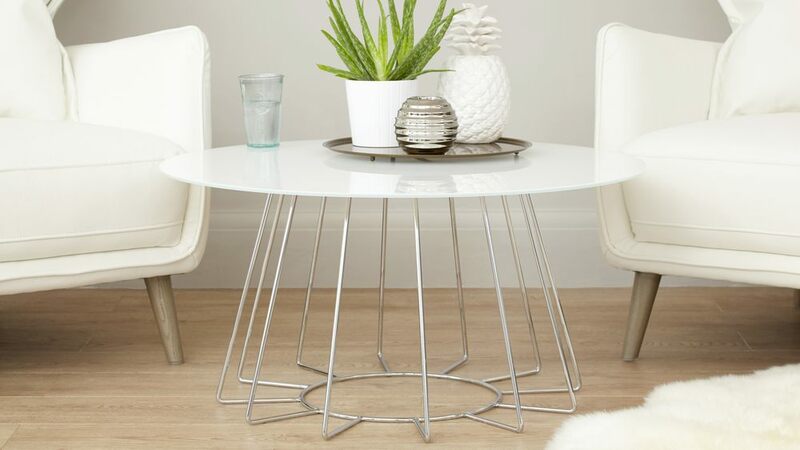 Finished in chrome, the base frame is also ideal for coordinating with existing items in your interior. 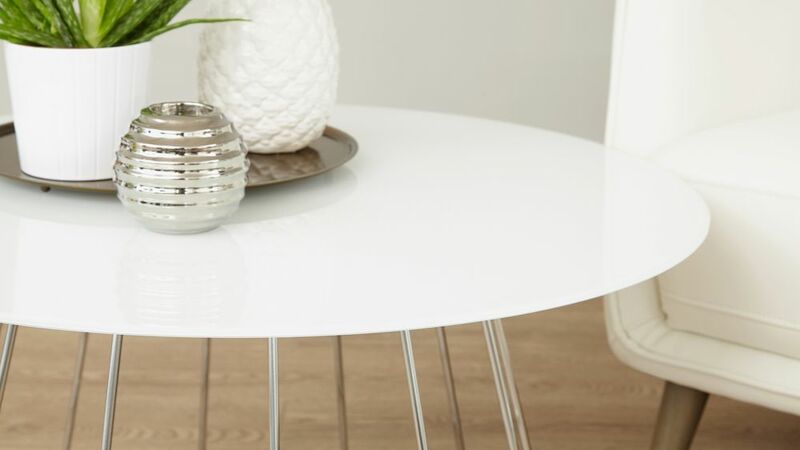 If you love the fresh, clean look of the Orbit White Glass and Chrome Coffee Table, we also have a coordinating Orbit White Glass and Chrome Lamp Table available that is perfect for creating a contemporary look throughout your living space. After something slightly more luxe? The Orbit is also available with a deluxe bronze mirror finish. We decided to use back painted tempered glass for our Orbit table for a whole host of performance enhancing reasons. Firstly, because it is an applied finish to the underside of the table, the white won’t be susceptible to marking or scratching as it is protected by the tempered safety glass. The glass itself is thin but incredibly strong and durable, keeping the table both streamlined and strong. The combination of white and glass also gives you the reflective qualities of something like white high gloss, while being reinforced by the durability of the tempered glass.